There is only one answer to ending these horrendous conditions for turkeys and for all the non-human animals who suffer for us. Their suffering will cease and they will be liberated if we stop demanding their use in our lives. Our compassion and our sense of justice can only end their exploitation if it is translated into the action of veganism. Their suffering will not stop until we stop breeding them into lives of abject misery at the outset. We must learn to relinquish our control of other animals. They do not belong to us. Every year over 650 million turkeys are brought into existence for the purpose of slaughter for human meat consumption. Approximately 252 million lives are taken by the American meat market and more than 240 million by the European meat market. Four million turkeys are bred and killed in a small country like Ireland alone. A lot of ‘turkey’ meat is imported and the violations endured by these birds cannot even be accurately ascertained. The vast majority of the turkeys bred and killed for human food have short lives that are filled with pain, fear and frustration. All of them face horrendous deaths. Some of us attempt to sooth our conscience by purchasing an ‘organic’, or ‘free-range’ turkey at Thanksgiving or Christmas. Unfortunately, this is of little help to the turkey who has been selectively bred in a way that greatly damages his or her health, and who has suffered a painful, frightening and unnecessary death regardless of what kind of life he or she lived. There is no humane, just, or painless way that other animals can give us their bodies to be our food. All ‘turkey’ meat was someone who suffered and whose life was forcibly ended. One of the main problems facing a domesticated turkey in today’s world is his or her legal status as an object or non-person. Like all farmed animals, they are regarded as the ‘produce’ of human labour in the same way as any other inanimate product. Their sentience is disregarded throughout their journey from breeding to slaughter. This is evident in the use of the term ‘factory’ in place of the term slaughterhouse. Research on the issue illustrates a language that is not cognizant at all of individual turkey beings with distinct personalities and personal histories; rather they are spoken of in terms of the mass weight of their eviscerated, lifeless bodies using the phrase ‘kill-out percentage’. Their objective status as our ‘property’ results in the legalized torture that is standard farming practice. The gruesome facts outlined on this website are not isolated cases of animal cruelty; they are the facts of our standard treatment of millions of turkeys and other sentient beings every day. Turkeys are tortured in many ways throughout their lives. The section of this website entitled Birth describes the torture inflicted on turkeys as they begin life on this earth. This includes standard industry practices of maternal deprivation and hyperconfinement. It also includes hanging newly hatched turkey infants by their heads while removing part of their beaks, and other mutilations such as cutting off their toes and snoods. These mutilations are inflicted without anesthesia or pain relief. Unsurprisingly they cause chronic pain. The average American consumes 17 lbs of turkeys’ flesh per year. The demand for animals’ bodies as human food is a growing market worldwide. For example, the demand has risen consistently in China at an average annual rate of 2.2 million tonnes over the last 30 years. To meet this demand for meat, turkeys are selectively bred to produce as much body tissue as possible, in as short a time as possible, with as little food input as possible, to maximize the industry’s profits The faster they grow, the sooner they can be killed, keeping investment in their welfare at a minimum until they reach the industry’s desired weight. Wild turkeys reach weights of between 8 and 20 lbs in adulthood (one year). 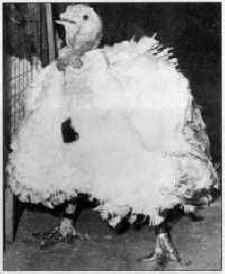 In the 1960’s turkeys were being selectively bred to reach weights of 35 pounds in 220 days. Today turkeys are killed as young as 60 days old, but more usually from 140 days onwards. Their average weight is 29 lbs. Turkey exploited at breeding facility. Turkeys have been bred to grow faster and heavier but their skeletons haven’t kept pace, which causes ‘cowboy legs.’ Commonly, the turkeys have problems standing…and fall and are trampled on or seek refuge under feeders, leading to bruises and downgradings as well as culled or killed birds. ...we must conclude that approximately one quarter of the heavy strains of broiler chicken and turkey are in chronic pain for approximately one third of their lives. . . . [T]his must constitute, in both magnitude and severity, the single most severe, systematic example of man’s inhumanity to another sentient animal. Their unnatural growth rate causes yet more health problems such as reduced immunity and susceptibility to infection, muscle disease, focal myopathy, ascites (waterbelly) which involves retaining so much fluid that they cannot walk, perirenal haemorrhage syndrome, cardiomyopathy (“round heart” disease), and aortic rupture. Mortality from these causes is at least 10%. In comparison to the free lives of wild turkeys who forage over great distances, eat foods of their own choosing, exercise their instinctual need to run, fly, sunbathe and dust bathe, and where the habitat has the space and variety for normal social interaction, including the need for personal boundaries, the life of a domesticated turkey is under complete human control. Unsurprisingly, their lives are dictated by the minimum investment necessary to maximise profits for the meat industry. For the turkey this translates into living in overcrowded facilities, sometimes with thousands of other turkeys, with little space to move. They are fed an unnatural diet; they rarely, if ever, see daylight, or feel the sun on their bodies, or the earth beneath their feet. They cannot flap their wings, never mind dust bathe. The floor of their housing becomes increasingly filthy, and the quality of the air they are forced to breath is such that humans entering these facilities can only do so when protected with face masks. Living conditions for most turkeys. These environmental conditions cause foot pad lesions, breast blisters, ulcerative dermatitis, and hock burns, which are all painful conditions, and which can lead to fatal bacterial infections. The accumulation of ammonia, dust, bacteria and fungal spores in the environment causes respiratory irritation, ammonia induced conjunctivitis, and respiratory infection. The question is how we stop inflicting suffering, of Holocaust proportions, on equally sentient other animals. The question is how we stop exploiting them? What about Free Range or Organic? The term ‘organic’ refers much more to the apparent quality of human food than to the living conditions of turkeys. Both free range and organic turkeys face the same death by slaughter as their factory farmed colleagues. They face the same health consequences of being bred to be human food as outlined above. What is the answer to these horrendous conditions? Several years of experience as a sanctuary director permits me to offer the following personal opinion on the benefit of sanctuary to non-human animals. Sanctuaries can only accommodate an insignificant number of the population of non-human animals who are exploited in industries such as animal agriculture. Although their rescue is far from insignificant to the animals whose lives are spared, it is my belief that not even sanctuaries are an adequate solution to the problem of our use of them. Sanctuaries cannot be repositories that mop up the vastness of the atrocity perpetrated upon non-human animals by the demands of humans for their use in food, entertainment, clothing and research. Nor should they even attempt to be. Regardless of how well run they are, or how respectful sanctuary workers are to the animals residing with them, they can rarely, if ever, replicate the liberty of the natural environment that belongs to those in the wild. The non-humans living in sanctuaries will carry the burden of being domesticated for the rest of their lives. We must learn to relinquish our control of other animals. Whitehead CC, Fleming RH, Julian RJ, Sorenson P, “Skeletal Problems Associated with Selection for Increased Production,” in Muir WM and Aggrey SE, Poultry Genetics, Breeding and Biotechnology (Wallingford, UK: CAB International, 2003), pp. 29-52. Duncan IJH, “Welfare Problems of Poultry,” in Benson JB, Rollin BE (eds.) The Well-Being of Farm Animals (Ames, IA: Blackwell, 2004), pp. 307-324. Martrenchar A, Huonnic D, Cotte JP, Boilletot E, Morisse JP, “Influence of stocking density on behavioural, health and productivity traits of turkeys in large flocks,” British Poultry Science 1999;40(3):323-31. Wyers M, Cherel Y, Plassiart G, “Late clinical expression of lameness related to associated osteomyelitis and tibial dyschondroplasia in male breeding turkeys,” Avian Diseases 1991; 35(2): 408-414. Martrenchar A, “Animal welfare and intensive production of turkey broilers,” World’s Poultry Science Journal 1999; 55(2): 143-152. Smith R, “Cutting edge poultry researchers doing what birds tell them to do,” Feedstuffs, 9 Sep 1991, 22. Baskin C. 1978. Confessions of a chicken farmer. Country Journal, April, p. 38. In Greger, M (2006) Bird Flu, Lantern Books: New York. Webster AJF, Animal Welfare: A Cool Eye Towards Eden (Oxford, UK: Blackwell, 1995), p. 156. Li Z, Nestor KE, Saif YM, “Summary of the effect of selection for increased body weight in turkeys on the immune system,” in Eastridge ML (ed.) Research and Reviews: Poultry 2001 (Wooster, OH: Ohio State University, 2001), pp. 21-28; Rauw WM, Kanis E, Noordhuizen-Stassen EN, and Grommers FJ, “Undesirable Side Effects of Selection for High Production Efficiency in Farm Animals: A Review,” Livestock Production Science 1998; 56:15-33; Wilson BW, Nieberg PS, and Buhr RJ, “Turkey muscle growth and focal myopathy,” Poultry Science 1990; 59:1553-1562; Leeson S, Diaz G, Summers JD, Poultry Metabolic Diseases and Mycotoxins (Guelph, Canada: University Books, 1995); Frank RK, Newman JA, Noll SL, Ruth GR, “The incidence of perirenal hemorrhage syndrome in six flocks of market turkey toms,” Avian Diseases 1990; 34:824-832. North MO and Bell DD, Commercial Chicken Production Manual, 4th edition (New York: Van Nostrand Reinhold, 1990), p. 456. 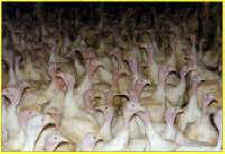 Estrada R, “Turkey Trends Buyers Like Idea and Taste of Gobblers Free to Roam,” Modesto Bee, December 22, 2002.